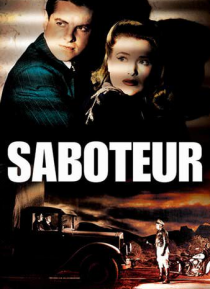 Alfred Hitchcock's exciting 1942 wartime thriller stars Robert Cummings as a Los Angeles aircraft factory worker who witnesses his plant's firebombing by a Nazi agent. During the deadly explosion, Cummings' best friend is killed and he, himself, is wrongly accused of sabotage. To clear his name, Cummings begins a relentless cross-country chase that takes him from Boulder Dam to New York's Radio Ci… ty Music Hall, and finally, to a harrowing confrontation atop the Statue of Liberty.